Coming this Spring, Sony will start rewarding gamers for their activity on PlayStation consoles. Believe it or not, "reward" is code for "fabulous prizes." If you're a loyal PlayStation gamer, then we have some good news for you! Sony has announced a new loyalty program for its customers, "PlayStation Rewards." The program will provide players with various awards and bragging rights based on the activities they engage in whilst using their PlayStation consoles. 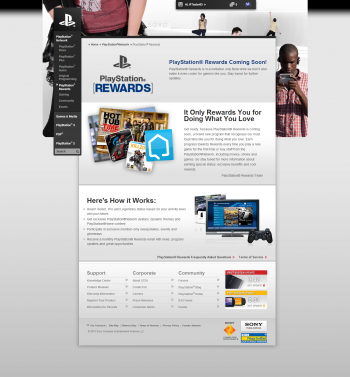 Currently, PlayStation Rewards is being developed for PS3 consoles, but PSP owners will eventually be able to participate, too. According to Susan Panico, Senior Director of the PlayStation Network, an online system is the best way to reward customer loyalty, since roughly 80 percent of PS3s are connected to the net. As a result, Panico explained that there's an entire online ecosystem to study. "I call [the ecosystem] hearts and dollars," Panico said during a recent phone interview. "It's not about just what [customers] spend, but what do they give back to us. And in a very simple way, we give them rewards to thank them for their participation." The program will even have a semi-RPG element to it. There will be three tiers of ranks for PS3 owners to gradually level up to. Users will start on "Select", move up to "Pro", and eventually hit "Legendary." There will be a progress meter for users to keep tabs on how their advancement is progressing. Advancing through the tiers will be based on players' activities. From the sound of it, just about everything will net some amount of experience points. Playing new games for the first time, buying content from the PSN, and taking surveys are just a few of the examples Sony mentioned. The program is sort of a spiritual successor to PlayStation Underground, Sony's very own digital game magazine. According to Panico, however, PlayStation Rewards will incorporate feedback from consumers much more effectively than its predecessor did. "Historically, our loyalty has been around self-reported data and a one-way relationship," Panico explained. "Joe Consumer would say, 'I have twenty games in these genres,' and we would send him information around his interests and occasionally engage him in a marketing survey. It was great for the time, but now that we have a connected device we really wanted to look at how we could create a two-way communication relationship with our consumers." Of course, loyalty programs tend to come with, well, rewards, and Sony doesn't plan to slack in this department. PSN users will receive virtual goods like items for avatars and Home spaces. There are also plans for real world rewards, with potential prizes including going to the Consumer Electronics Show in Vegas on Sony's dime. The service isn't due to launch until (tentatively) next April, but PlayStation Plus members are being invited to participate in the beta program in the very near future.